How to pick the right pant for you? When it comes to picking the right pant for hunting season, a lot of properties come into the mix. 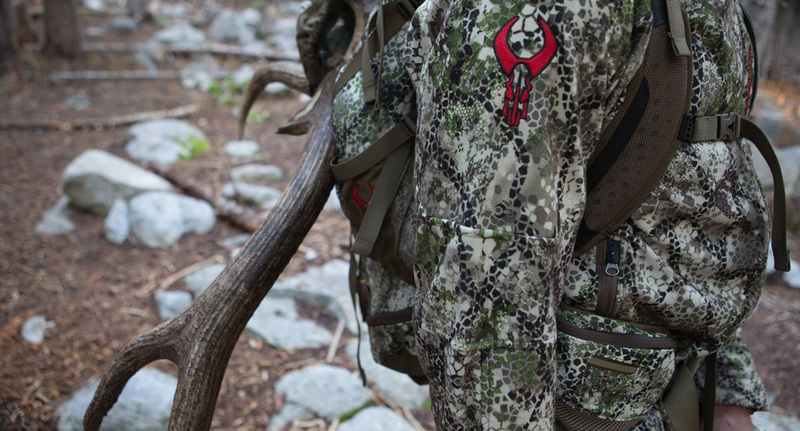 You have weight, what materials, as well as fitting and overall hunting experience you're looking to get out of them. The best question isn't "What's the best one?" but "What's the best one for me?". To figure that out, I've gone ahead and compiled a list of major features and differences between both pants. 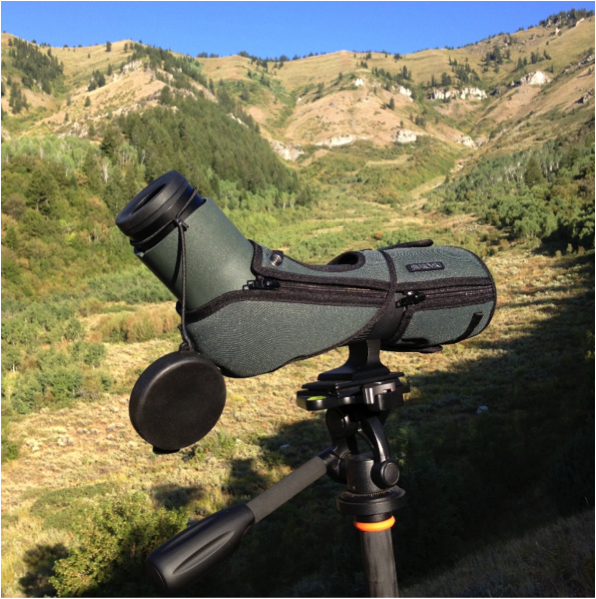 This way you can pick with the confidence that you will get exactly what you want and expect out of the pair that fits your personal hunting needs. I personally own one of each and have used them for over the last couple of years and have been extremely impressed with both pants. 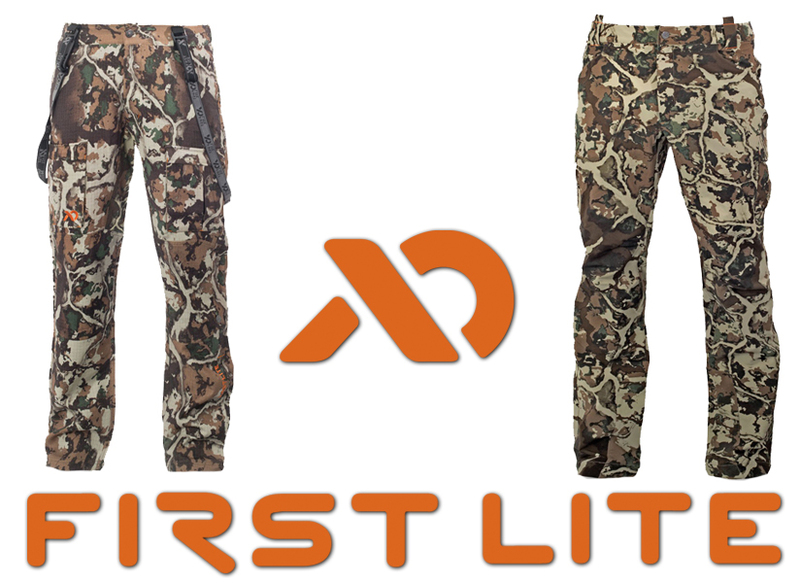 The First Lite Kanab Pants were a game changer to the hunting industry. Nobody before had ever used Merino fabrics into a outwear hunting pant. This really defined how other manufactured viewed "Lightweight" pants and you could even say they were the pioneers for some of the technical pieces that are out now a days. 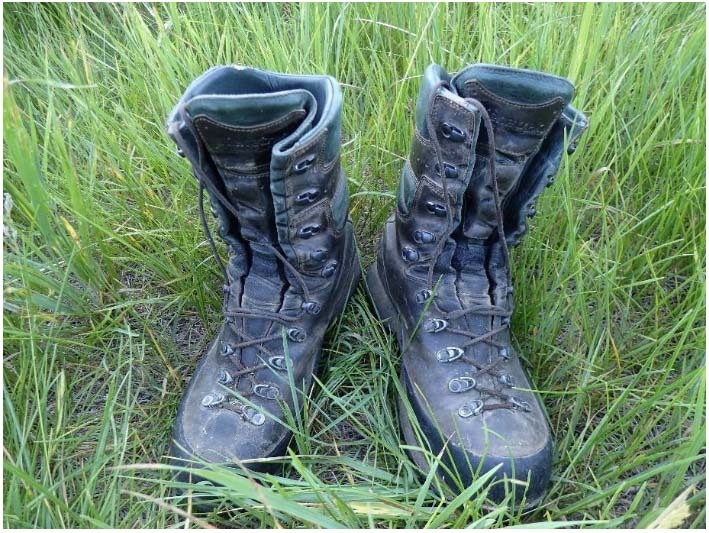 Like every first timer, there is bound to be hiccups but last year they listened to their customer's feedback and redeveloped the Kanab pants which is now the Kanab 2.0. 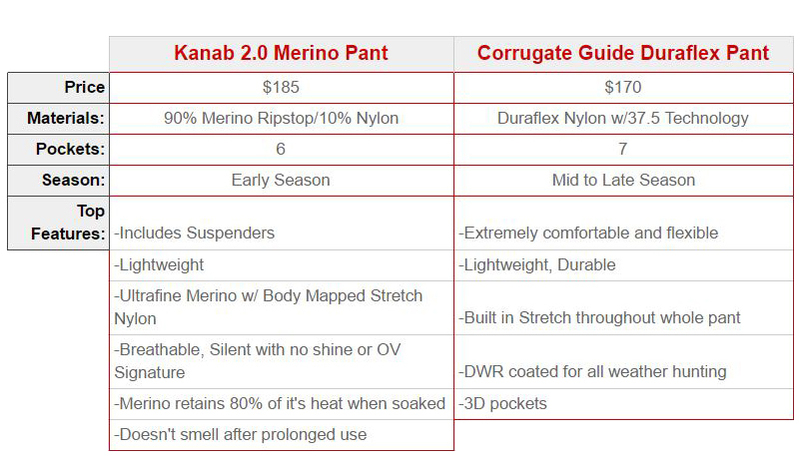 The major differences is on the older Kanab, the pant was made completely out of Merino Rip Stop which was awesome, besides in areas under sever stress. What was happening is that as people were stretching the fabric past it's limits, like lifting their legs over logs or hoping in the bed of a truck, the crotch had a tendency to rip open. Same with around the knees where that fabric was pulled tight on prone or kneeling positions. While I never had any issues with the original I was definitely a huge fan of the advancements they added to the Kanab 2.0. Now in those high stress areas you have a extremely durable nylon stretch material that not only holds up way better but allows complete freedom of movement to give you an overall better experience and feel when hunting in these pants. For those of you that have gutted a dear or field dressed an elk, you know that a sharp blade is really nice to have. Recently there has been an emergence of the 'Replaceable Blade Knife'. 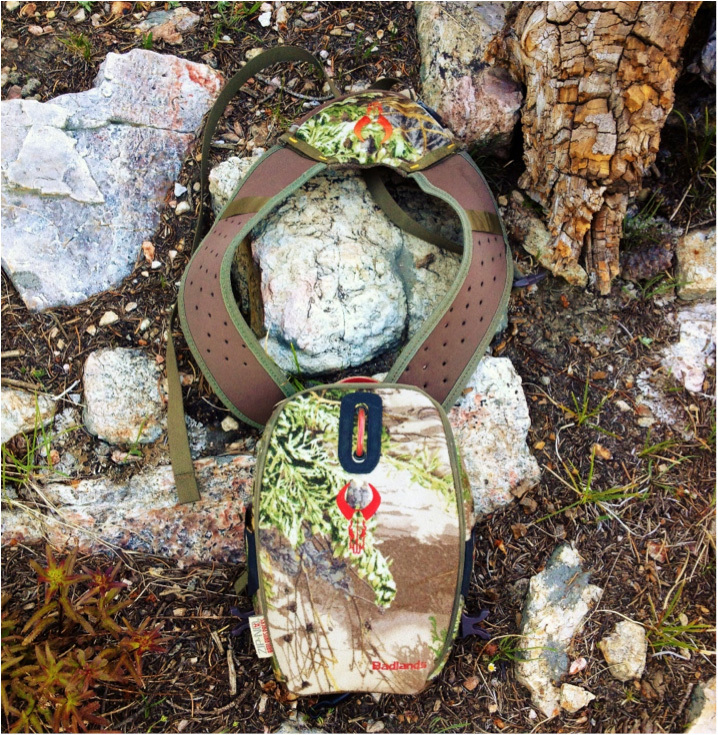 Havalon was the first to come out with the concept for the hunting and outdoor industry, but many other players have jumped into this arena to compete and bring their own flare to the concept. The other 2 designs that we have chosen to bring on so far are from Gerber and Outdoor Edge. We'll be reviewing the comparable knives from each of those brands. The concept of the 'Replaceable Blade Knife' has really changed the way that people field dress their game. For centuries, hunters have used fixed and folding knives, or sometimes a series of knives to gut, skin, and bone out meat from animals. Almost always, the blade starts out sharp and gets more dull with each cut made. The idea of having a fresh blade throughout the process has hunters migrating towards this concept. Many people say it's a game changer and we're happy to take your feedback in the comments section below. 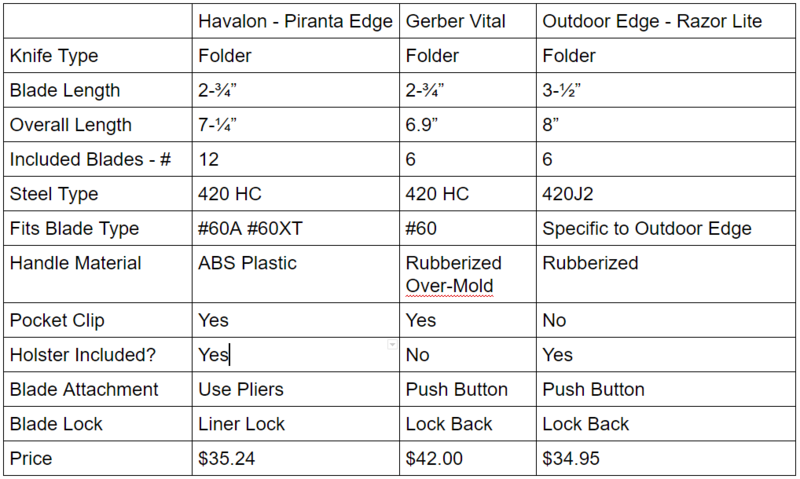 In order to make an apples-to-apples comparison, we took the standard knife from each of the 3 brands, the Havalon Piranta Edge, the Gerber Vital, and the Outdoor Edge Razor Lite (Blaze). Each of these are really the standard edition from each brand. All three brands have other replaceable blade knives in different shapes, sizes and styles you can check out on our site, but for the purposes of this comparison, we would like to stick to the basics. All 3 knives are folders. The Havalon has a liner lock, whereas the other two are lockback folding knives. The Havalon and the gerber have 2-3/4" blades that are nearly identical. They are a #60 blade and both are made from 420HC Stainless Steel. The Outdoor Edge uses a proprietary blade that was specifically made for their knives, and made from 420J2 Stainless Steel at a longer 3-1/2 inches. The difference between the 420HC and the 420JC is the carbon content. The HC stands for 'High Carbon' and contains about .5% to .6% carbon, whereas the JC comes in around .3% to .4%. All that means is that the 420HC is going to ve a little bit more hard, a little more brittle, but will hold an edge and sharpen a bit better than the 420JC. All of these blades are crazy sharp. For the Piranta Edge and the Vital, they are literally a surgeons scalpel so be very careful when 'testing' how sharp they really are. Marmot is a great brand that we have always been able to trust in providing good quality gear at a reasonable price. 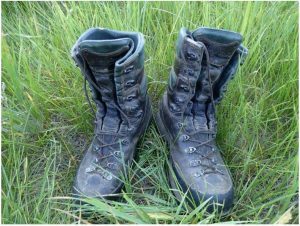 In this post, I wanted to share with you all some of the things that we covered in our employee gear training clinic that our Marmot Rep put on for us. They covered a lot of things including the new 2016 Sleeping Bags and Tents, the Universal Temp Rating System that they use for testing Sleeping Bags, Goose Down Specs, and Lifetime Warranty. To briefly go over who they are, Marmot began as a sleeping bag company, but have evolved into a company that covers a lot of essential camping gear. They continue to pioneer new concepts in camping gear, and have a great role in building value and insulation standards in the outdoor industry. Marmot has added a new insulation concept to their 2016 lineup. They have created a new set of down/synthetic composite bags, including the Quark and Ion. This combines the lightweight warming and insulating power of goose down, and combining it with the durable and moisture wicking ability of a synthetic insulation. It's a great new concept and may very well become a new standard in sleeping bag insulation. 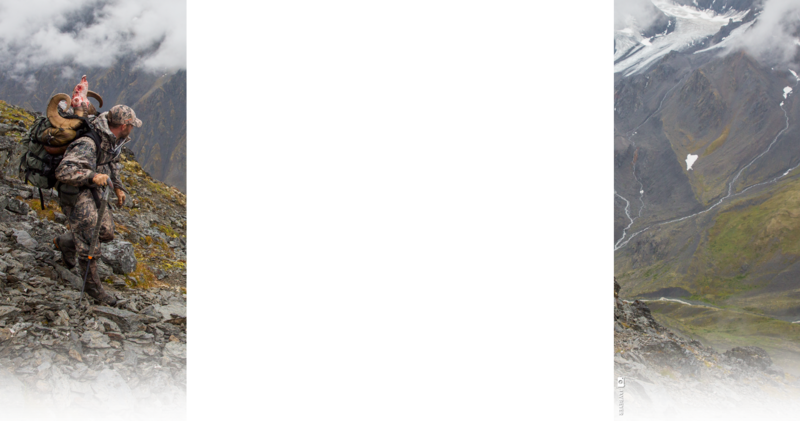 Down is the cornerstone of Marmot as a company. 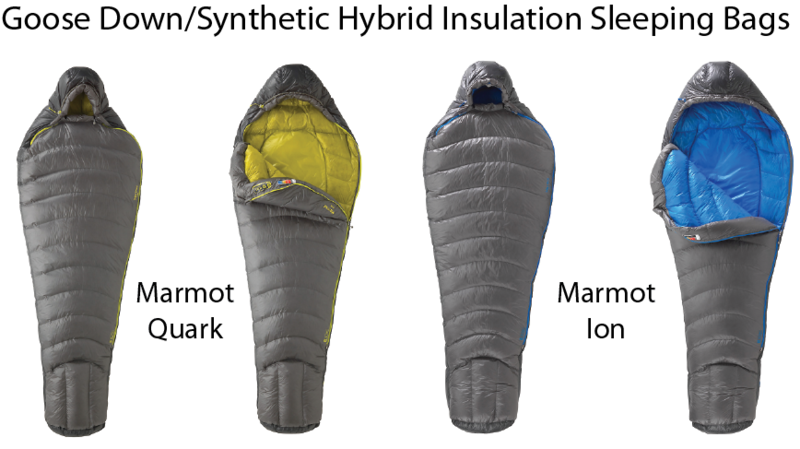 Down sleeping bags were the first Marmot products produced. No synthetic surpasses the lightweight, compactability and longevity of down. 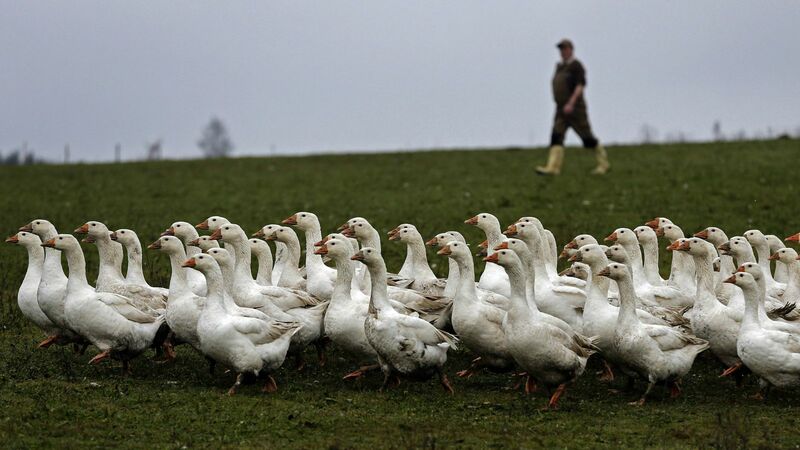 Marmot has cornered the market in Eastern Europe on some really high quality geese. These geese are much older than the geese normally raised for market. Older geese produce mature down with larger, stronger and longer lasting down clusters and this is the down they use in their 800, 850 & 875 fill power bags. 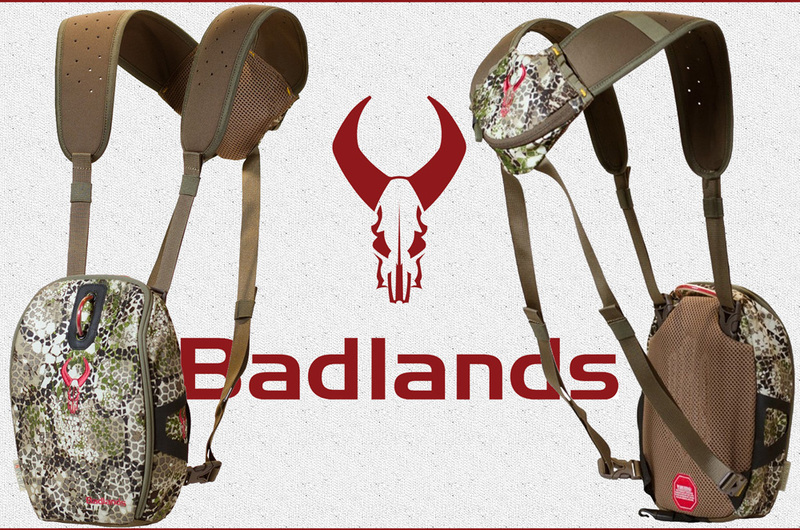 The 2016 hunting season was rapidly approaching and I was in the market for some new game bags for the year. I looked into a bunch of different options and brands but had a hard time deciding on what I wanted to go with. I have had some bad experiences with some cheap bags in the past, either not holding meat well, bugs getting in, or bags ripping, so I definitely wanted to get some quality bags this time and save myself the headache. 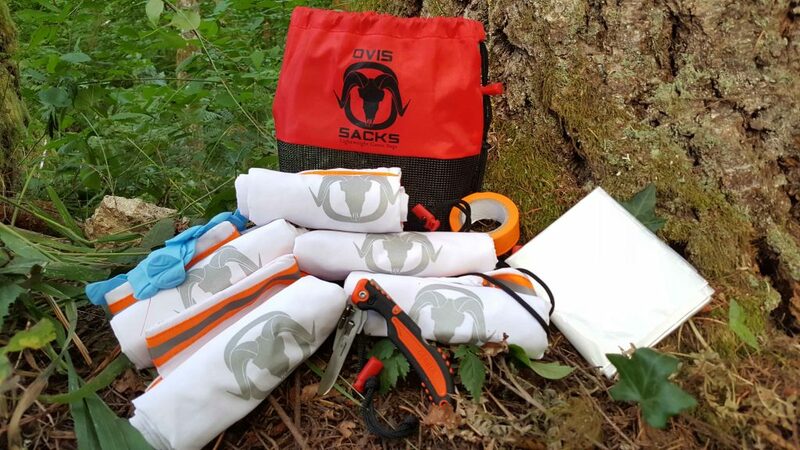 After some solid searching, I found BlackOvis had started making their own high quality meat bags called "Ovis Sacks" and not only that, they put together a Ready-To-Hunt kill kit that included them. The Kill kit they put together was awesome, it comes in two different sizes and had all the essentials needed for when you get your animal down. The difference in size kits determines the size of the meat bags that it comes with, the options to chose from were large and extra large. Each Kit comes with 40' of light weight flagging tape for marking your blood trails, a pair of latex rubber gloves, a 5'x3' plastic sheet for laying out your meat and keeping it clean as you break your animal down, and they give you the option of three knives to choose from. I thought it was super cool they gave you the option of knives, you can choose from a Havalon, Outdoor Edge, and a Gerber Vital. I chose the Large kit and went with the Gerber Vital, the large bags sounded perfect for me, and I have used the Gerber Vital before and really like Gerber products. As usual with BlackOvis orders, I received my package very fast. I opened up the kit, and checked out all the included items, I could not have been happier with every thing! The kit came with all the items described above and five meat bags, four 16"x24" quarter bags, and one 14"x18" meat parts bag for backstraps, tenderloins, and other bits you want to bring home. The meat bag construction was on point! They are made from Taslan nylon, so they are super strong and durable, they breath extremely well and are machine washable. They have a sewed on reflective strip around the entire bottom, great for spotting your bags hanging at night with your head lamp, and the draw string on the top is solid as a rock. Being the gear nerd that I am, first thing I did with the meat bags was a durability test and they passed with flying colors. I put a 50 lbs sand bag in them and did a hang and drop test, the bags handled the weight like a champ! The seems didn't even look stressed and they hold their shape with the weight which is crucial for when packing out, nothing worse then your meat balling up in the bottom of you pack on the pack out. Overall I feel BlackOvis knocked this Kill Kit out of the park, it has all the essential items you need for when the real work begins. the only thing I personally plan to add to the kit, is some 1.8mm reflective guyline for hanging my bags when the time comes. It is super light weight and small and fits perfect in kit. 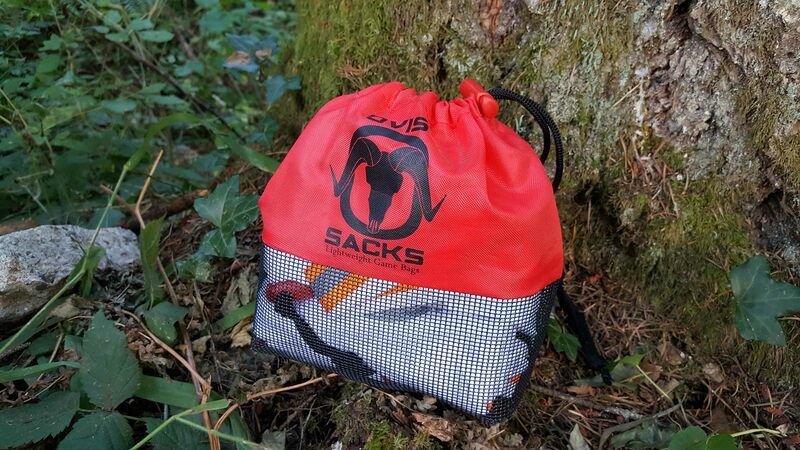 If you are in the market for some new game bags this season, I highly recommend the "Ovis Sacks" and spending a few extra bucks and getting the kill kit, you will not be disappointed.